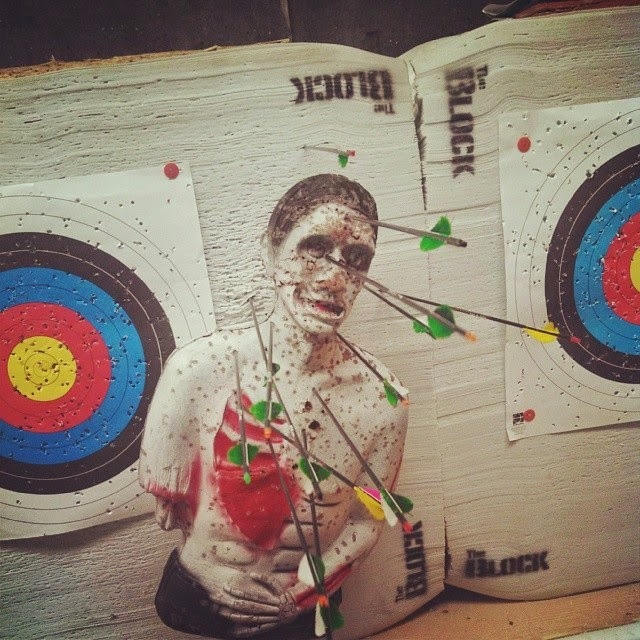 The Marvelous Misadventures of Madam Geek: Archery! Disclaimer: In no way, shape or form am I an expert in the way of archery. (Even though I shot a zombie in the head as if I were Hawkeye. Continue reading for more information...) This merely details my first experience. 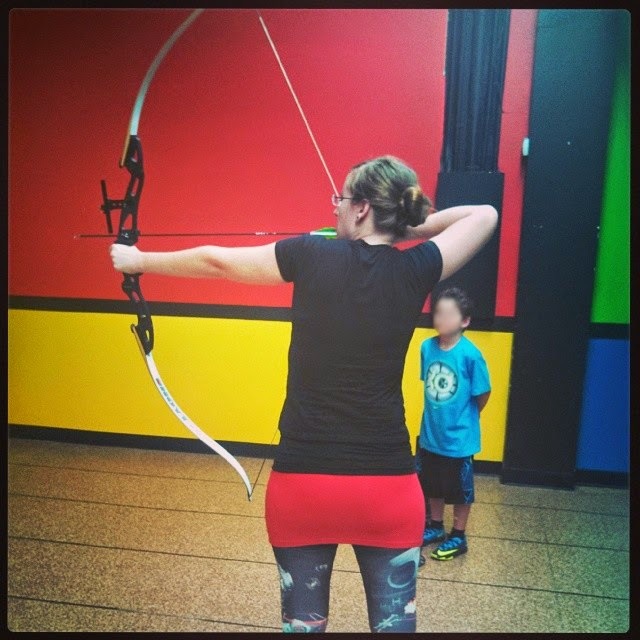 Last weekend I channeled my inner Link, Legolas and Mulan (post-training) to learn archery! Let me begin with the path leading to this grand experience. I purchased a Groupon for an archery lesson for one or two people at Archery Headquarters in Chandler, AZ which included an ‘Intro to Archery’ lesson, no equipment fee, and a bit of free time to shoot.The going rate of the class I attended is $25 for one person, seeing as how Tauriel, and Link are some of my favorite characters, making the decision to pay the fee was an incredibly easy one. The overall experience with this business was marvelous. The instructor was phenomenal, the equipment and facility was clean and well kept, and making the appointment was easy. As I arrived at the range and saw the targets, my excitement began to boil over like an unsupervised pot of ramen. I’ve always wanted to learn how to shoot a bow for either hobby, or survival benefit. When the zombie apocalypse happens, I’d like to know that I have the skill to wield a weapon that won’t make an echoing blast. The instructor thoroughly explained the commands of the range and taught us the proper stance. After going over how to nock (or ‘load’) an arrow and draw, we were summoned to the line to begin shooting. As round after round went by and helpful tips were mentioned, we were given balloons to put on our targets. Being competitive in nature, I had to massacre that little rubber housing of hot air. Soon, our quivers would be out of arrows and we began round two of attempting to slay the foul beast. I quickly realized that the only ones left with a balloon was myself and the seven year old to my right. Who, upon noticing the same thing, said,”I think they gave the big ones to the smaller people.” Eventually, that satisfying burst of air escaping it’s stretched out prison left me elated. Was it time for my second rubber victim? Oh no. The instructor revealed our next targets to be zombie busts, and gave us a challenge after separating us into groups. The dream team assembled. While taking turns, as children’s shows have taught me since I was five, we released arrows into our braindead prey. Feeling accomplished after various headshots, we learned that we had lost the game. Did it matter? No. However, as with any sport, a bit of friendly competition is fun. There are numerous tidbits of new information that came along with this fun filled day. While learning archery may seem like a daunting task, it is a lot easier than expected. That being said, don’t be deterred from giving it a go simply because you don’t believe you can do it. Archery does work your arm, back and shoulder muscles; however, take it from this noodle arm wielding blogger, don’t be intimidated. I didn’t believe I’d be strong enough to draw a bow, let alone hold steady enough to aim; yet, above is the evidence that spaghetti arms can be lethal. Stance, follow through, and breathing are all vital elements to shooting well. At first I kept forgetting to follow through and once I released my arm fell limp, causing my aim to suffer. Having an absolute blast with this experience sparked my interest in archery a bit more, and in turn I began researching equipment. Compared to other sports, archery is fairly priced. Though a beginners bow will run you at least $150, and that’s just the bow. The feeling of readying an arrow and letting it fly to witness your budding skill is one of a kind. Though I had a feeling this would be a great experience, I was unaware of how enjoyable and unique it would turn out to be. I was equally oblivious to the interest that would be launched to explore more about archery as a hobby. As I walked through the door of the range and back out into the world, I felt a little more prepared for survival situations and had a new hobby to research. Very well written article, keep up the good work!